This last year I discovered a gadget that has been one of the best purchases I’ve ever made…and you might want one, too, when you hear how terrific it is! Extremely durable. You can throw them in a backpack, take them with you anywhere. Constantly saves your work so there’s never any need to save or backup. Resumes right where you left off when you last turned it off (you can set it to have a key lock so you won’t inadvertently bump it and turn it on). Has eight files that can hold up to 25 pages of writing each. 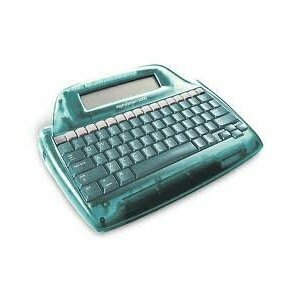 Has a built-in thesaurus, word count, find/replace function, font-size adjustment, and spell-check. There’s a handy reference list on the back with commands and shortcuts you need for writing and editing. You can search the internet and download the user manual. You can print directly from the Neo. Runs on four AA batteries that last literally for years. Auto-shut-off after a couple of minutes. Never gets hot like a computer so you can just work with it on your lap. Here’s a fantastic benefit—no internet! No distractions! Just a pure, simple writing tool to capture your thoughts. I thought I wouldn’t like the small 6-line screen, but I find it actually a benefit to focused writing. You can adjust how many lines of type you want to see. I love the keyboard touch. They don’t need a case to protect them, though you can purchase one. I just got an oversized, padded purse from a thrift store and it works great. Mine also fits handily in my canvas briefcase. 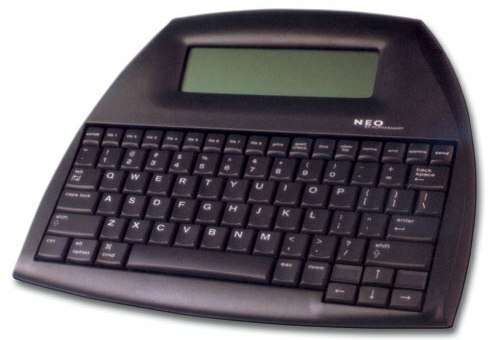 There are a few earlier versions of the Neo available (ex: the Dana), but the only one I would recommend is the Alphasmart 3000, which are usually a bit cheaper. These have a keyboard that is good for those who require a more defined touch. We got an Alphasmart 3000 for my aunt after she had a stroke, and it has been excellent for her hand therapy and fine motor exercises. Neos and Alphasmarts are popular among the writing community. I first learned about them from a writer whose glowing recommendation convinced me I couldn’t live without one. Participants in the annual NaNoWriMo writing challenge rave about way Neos help them meet their daily writing goals. I did the NaNoWriMo challenge this last fall and worked on my files with my Neo while travelling. Be prepared for a lot of questions—people are fascinated with this new gizmo! I take my Neo with me everywhere. As I write this post, I’m whacking it out while we drive to an out-of-town appointment. I keep it beside me in my devotional time, capturing thoughts, writing prayers, or working on Bible study notes. When a blog post idea hits me, I can quick get it down before I forget it. It’s wonderful for journaling. I use it as a planner, list-maker, project & idea brain-stormer, letter writer…you get the idea. It’s fantastic for school! SweetPea, computer lover that she is, often prefers her Neo for roughing out a writing assignment. No distractions. My honey uses it for Bible study notes when he’s preparing a message for the jail ministry he’s involved in. The immediacy and ease-of-use makes it the perfect study tool. Take them camping or on vacation…on airplanes…to the library…to conferences…taking notes from TV or DVD programs…anywhere you’ve got a bit of extra time and two hands free! So…have I convinced you yet? I’d recommend doing an online search by product name and you’ll get a lot of information. Also, the user reviews on Amazon are helpful. 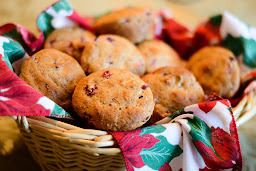 And here’s a thought—these make wonderful gifts! This gadget is going on the to-buy list--for me. I confess that I am a bit of a dinosaur in that I prefer the sensation of actually pressing keys to type as opposed to touch screens. Hi, Gin! So nice to be reconnected! Thanks for stopping by and leaving a comment. I'm delighted to be in touch again. Yes, hope the Neo works for you--I love mine and have found it to be a great help rather than a hindrance of "one more gadget." Huh, I didn't now I needed one, esp. since I've never heard of it before, but I'll have to give it some serious thought. Perhaps I do NEED one. I could see it being useful for taking notes at Ladies Bible Study-- I'm always taking notes of one kind or the other and I don't esp. like my handwriting -- it's much faster to type something out. Yep, I think I need to look into this. Thanks Wendy!